Chicken Cordon Bleu Sliders have all the wonderful flavors of the traditional Chicken Cordon Bleu but in this adorable little sandwich! Everyone will love this new twist on a classic! Compensation was provided by Gallo Family Vineyards via Sunday Supper, LLC. 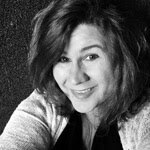 The opinions expressed herein are mine, and are not indicative of the opinions or positions of Gallo Family Vineyards. Are you a football fan? We have always been fans and love to watch the games. In our younger years, Don and I used to go to the games. We went with friends and it was a lot of fun, but now that we are a little...ahem...older, we appreciate watching the games at home. That doesn't mean we are party poopers! We still like to tailgate! We just like to do it at home. So this weekend I cooked up a delicious treat for us! My Chicken Cordon Bleu Sliders are easy to make and you won't believe how amazing the creamy wine sauce is! It is so addicting all you want to do is dip bread in it all day long, so putting it on some delicious sweet dinner rolls made complete sense to me! The wine is what makes this sauce out of this world! I love cooking with wine! Especially when making a sauce. The flavor of the wine elevates the sauce to a whole new level and really adds an entire new dimension of flavor. 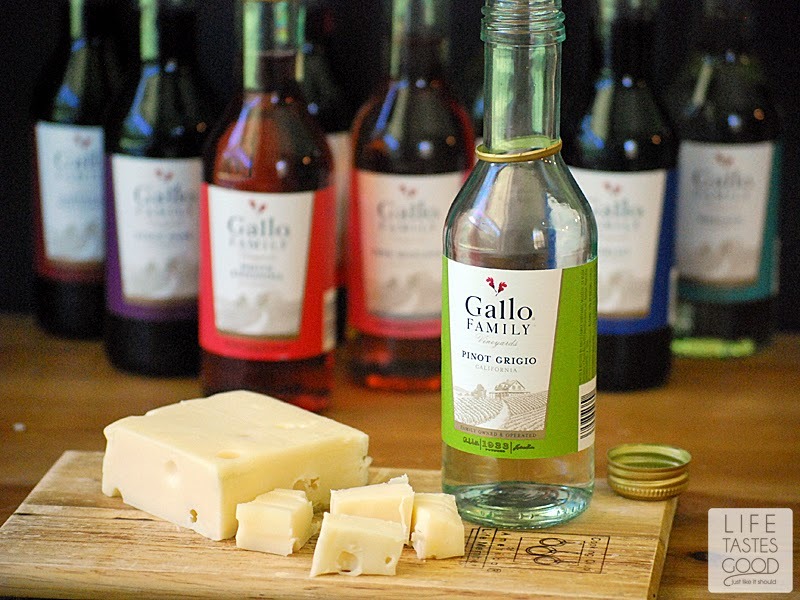 The handy mini bottles from Gallo are perfect for cooking! The mini bottles take up very little space, so I can have all the different varieties on hand, and the compact size makes them easy to pack if you do hit the road to tailgate with friends at the game! Love it! The #SundaySupper team and Gallo Family Vineyards have joined forces this week to bring you all of our favorite tailgating recipes and wine pairings. It can be difficult to choose the perfect wine for any dish, but especially for a BBQ! Not to worry! Gallo has us covered! Check out their suggestions for your next BBQ to always have the perfect pairings! If you aren't sure where to find Gallo Family wines, you can check their store locater and don't forget to snag the coupon to save on your next purchase! Y'all know I love to save! In a bowl mix 1 pound ground chicken, 1/2 cup seasoned bread crumbs, 1 egg, 1/2 tablespoon freshly minced garlic, 1/2 teaspoon salt, 1/4 teaspoon pepper, 1/2 teaspoon paprika, and 1 tablespoon freshly chopped parsley. Mix well until combined and set aside. Next up we need to coat our sliders with a breading so they get nice and crispy. In a small bowl or a paper plate, mix 3 tablespoons all-purpose flour, 1 teaspoon paprika, 1/2 teaspoon salt, and 1/4 teaspoon pepper. Mix this up really well. Separate the meat mixture into 8 equal portions and working with one portion at a time, coat it with the flour mixture and form into a slider sized patty. Continue until all patties are coated with the flour mixture. Heat a large skillet over mid-high heat and melt 3 tablespoons of butter. Add the patties and sear on both sides. About 3-4 minutes each side to get a nice crispy sear. When you have a good sear on all sides, reduce the heat to low. Combine 1/2 cup Gallo Family Vineyards Pinot Grigio with 1 teaspoon chicken and mix well. Pour the wine into the skillet and enjoy the wonderful aroma. It smells so good! Cover and cook on low for about 10 minutes or until chicken is cooked through. An instant read thermometer should register 160 degrees when inserted in the thickest part of the patty. When the chicken is cooked through, remove the patties from the skillet onto a foil lined baking sheet. Combine a 1/2 tablespoon cornstarch with 1 cup of heavy whipping cream and add to the skillet. Turn the heat up to medium and whisk in the whipping cream mixture until the sauce thickens. While the sauce is thickening, top each patty with a slice of ham and a slice of cheese and place under the broiler until the cheese melts. Be sure to watch it closely. It will melt quickly! Once the cheese is melted to you liking, remove from the oven. Get your buns ready and place some greens on the bottom bun. 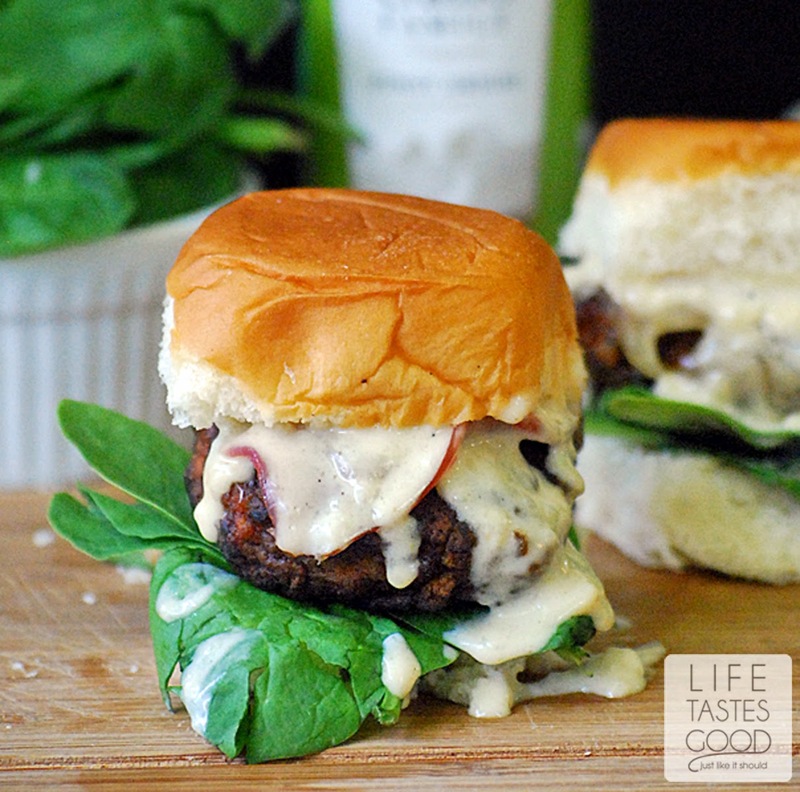 Top the greens with a chicken patty and top with that delicious creamy wine sauce. Add the top bun, serve and enjoy! Check out all of the delicious recipes by the #SundaySupper family. You are sure to find everything you need to make your next tailgating party a success! 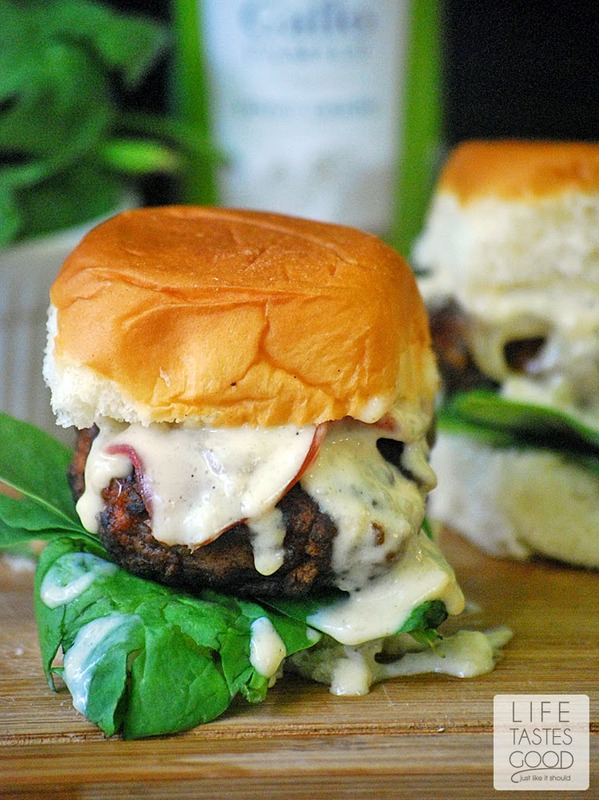 These Chicken Cordon Blue Chicken Sliders look amazing and would be great for tailgating! I love your photo with all the wines. I haven't had chicken cordon bleu in ages and I this way is even better than the traditional one. Oh my gosh! Your sliders look perfect and so scrumptious! I love it! I am totally loving these!! Oh my - that wine sauce sounds absolutely awesome!!! It is definitely a keeper, Katie! Thanks! Now THIS is my kind of slider! :) And what a sophisticated recipe for game day! Pinned. 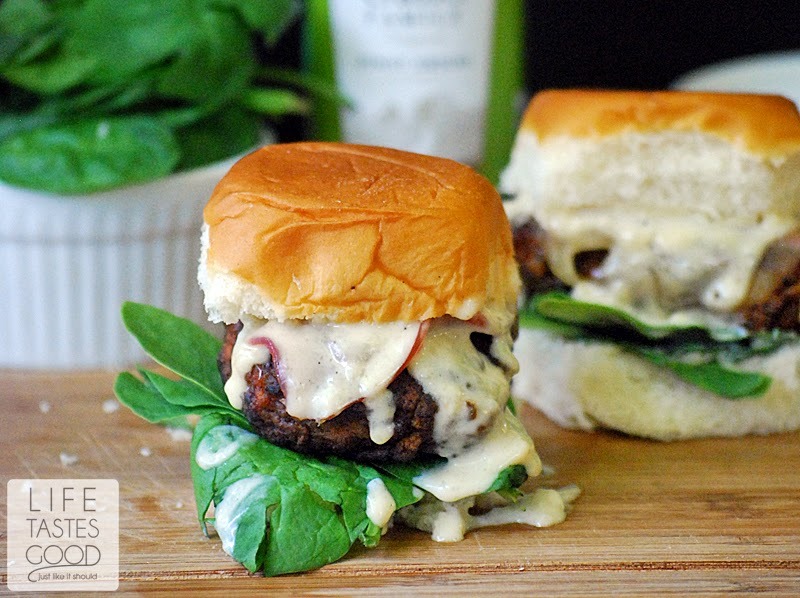 These sliders look delicious. I love cooking with wine. These look fantastic! We love any type of burger, and wine too?? Yes, please! These look perfect, Marion. We LOVE sliders here and the chicken cordon bleu take on it is a great idea. Add a glass of wine and I'm good! Now this is a recipe I know my husband and kids could get behind. They will love it. Thanks for sharing, it looks awesome. I love this idea and they are so cute! I love that you coated the filling to get nice and crispy - super yum!! Would you believe I have never had chicken cordon bleu? This slider seems like the way to go to give it a try! Looks amazing! Shelby!! You are missing out!! You totally HAVE to have Chicken Cordon Bleu. The traditional recipe I have on the site is made with this same sauce and is soo amazing! I hope you try it soon! Thanks for stopping by!